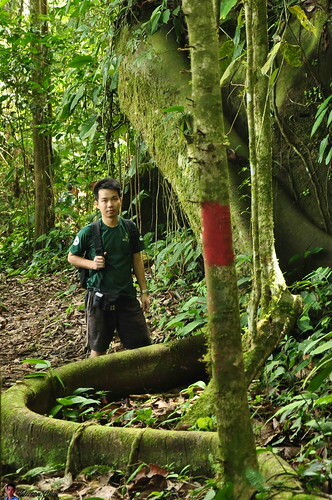 My first trip to the Borneo Highland!!! Finally I had the chance to go. I joined 4 of my friends to Borneo Highland...well technically we’re there for the Sarawak Bird Race event, which organise by the Malaysia Nature Society, but we did not join in the event and went on our own to the trail all the way to Batu Panggah (the curse stone), then the Penrissen Summit, and back down again on another trail to reach the golf course hole no.13. Borneo Highland is the only resort in Kuching, Sarawak which sit on top of the mount at around 1000 meters above sea level. 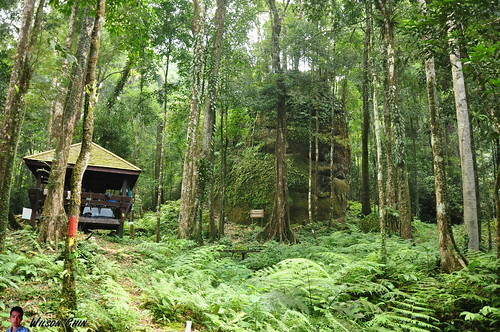 And its surrounded by the thick rainforest with rich flora and fauna. To go up to the resort, they don’t allow personnel car to drive up, as we can only park our car at the foot hill, and the resort will use their own vehicle to pick customer up to the resort (which I don’t like). 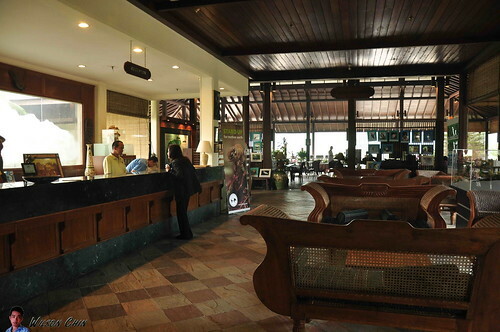 The Borneo Highland resort is build just right next to the Kalimantan (Indonesia) and Kuching (Sarawak) border. 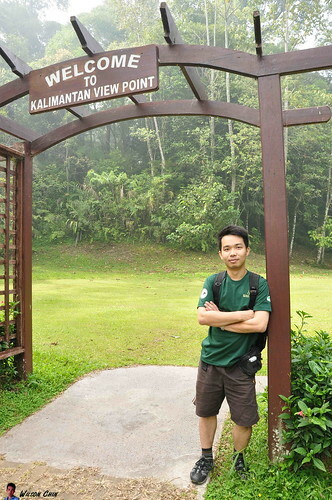 So there is a viewing point where we can view Kalimantan with our naked eyes. So that morning I woke up at 5.30am, cleanup myself then my friend pick me up at around 6am. We went to 10th Mile, the Padawan town to have kolo noodles for breakfast. 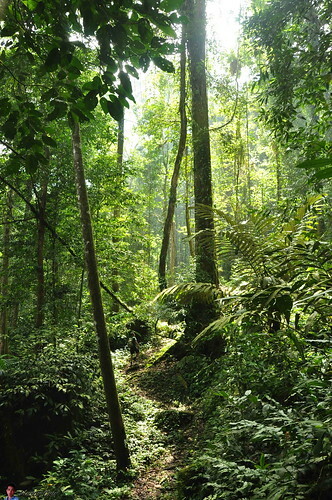 Then drive another 45 minutes until we reach the Borneo Highland resort. It was a hazy morning, that’s the first time I went there, so I just sat at the back of my friend’s car, quietly and enjoy the misty morning ride up to the resort. 8:00am, on our way up to the resort. We stop by to took some pictures on the waterfall. It was beautiful! 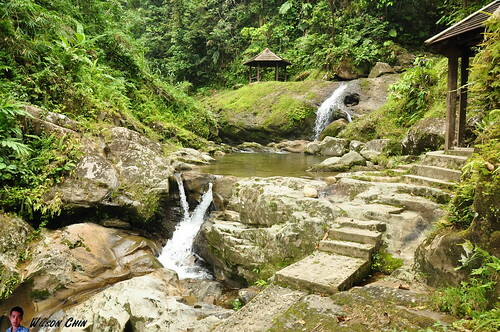 There is a pagoda, and stone steps which allows us to walk in to the waterfall. The water are crystal clear, I washed my face with the stream water, cozy!!! I can hear the sound of the flowing water, the birds singing, and some morning breeze gently blowing to my face. 8:32am, reached the resort. We then registered ourself (remember we went there for the Bird Race :P ) and then went for 2nd round of breakfast. All the food at the resort are vegetarian. No meat is served here. 08:51am, I went around the resort and took a few pictures. There are quite a numbers of chalet build around the area. Is a perfect place for people who want a quiet place to relax and embrace nature. 09:33am, this is the starting point and the distance to Batu Panggah will be around 6600 meter. 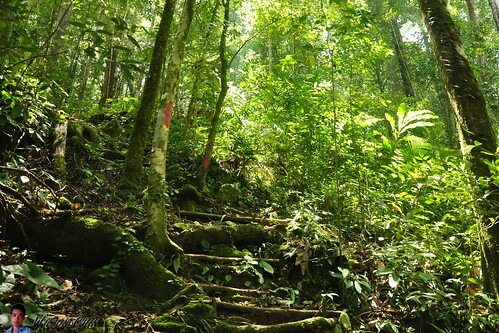 So for the Kalimantan viewpoint we will skip it first, and start our jungle trekking. Two of my friends are birds watcher, they equipped with their binocular so along the way they can stop and watch birds which live in high altitude. 10:28am. The forest here is are mostly in a rather high altitude, it somehow gave me different feeling than the one that I normally hike in lower ground forest. The trees here are huge, but not as huge as I found in the Matang area rainforest. 11:07am. There are 4 of us, two walk in front, I’m in the middle and frequently stop to took some picture and video. There is one way behind me also enjoying the forest view. There are some distance between us, so I just keep on walking, there are a turns which I took that I assume the two in front is going this way... I just keep on walking, not until I notice that the trek become strange. I check my mobile, and there are no reception there. My friends are nowhere to be found now, and I’m in the middle of the jungle. So I stop and wait for my friend at the back to catch up to me, after waited for 10 minutes, still no sign of anyone. And instinct told me that I should go back, and take the other turn (which will take about 15mins), should I follow my instinct, or should I continue assume that my friends are just in front? If its you, what will you do? 11.35am. For me, I took the first option by follow my instinct and walk back and took the other turns and went up hill. Just when I start to hike up hill, my mobile rang, and my friends called asked me about my location. I told them that I’m now following the red mark which painted on the trees, they told me that I’m going the correct way, and they are waiting in front for me. 11.41am. Meet my friend on the rest stop, and this is one of our destination. 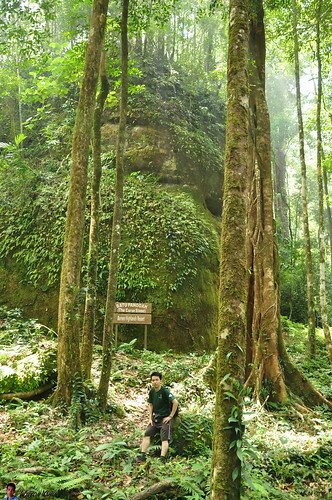 And this place is caled the Batu Panggah also known as The Curse Stone. 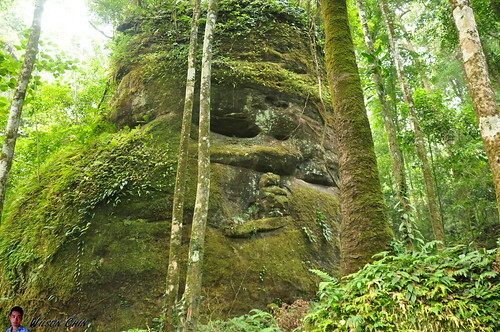 Batu = Stone, and Panggah is Head House. 11:46am. I did some searching over the Internet, and found the following story about this place. Long ago, there was these two villages of the Iban who enemy each other and forbidden to enter each other territories. They even hunt each other’s so called “Warriors' Head” to proof their power! They named themselves “The Head Hunters”. A guy and a girl from both different villages fall in love with each other which is forbidden and not allowed. They was being advice to stop seeing each other but they fail to do so and was found out by the Tuai Rumah (Head of Village). From the blur view through the water drops, they saw a wooden house. They decide to enter as shelter from the heavy thunder storm. That was not just any normal wooden house but the mysterious “Head House”, used to store human’s head (or skull) as a Symbol of Victory. But legend has it that no woman (any female include children) should ever enter or else…. No one really sure what is the real whole story for both the lovers but this is the only piece of story passed down. 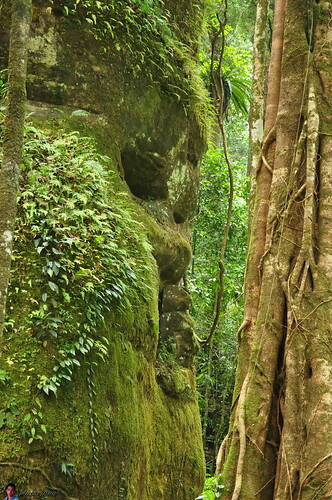 Let’s get a closer look at the stone, from the first picture it really looks like a face of a person. By the time I wrote this, I was alone in my reading room and it gives me goosebumps while writing this, its 11.36pm when I wrote this. 11.59am. We also meet three youngster camp there for 2 nights already, they’re the students from the University Malaysia Sarawak, currently studying Biology. 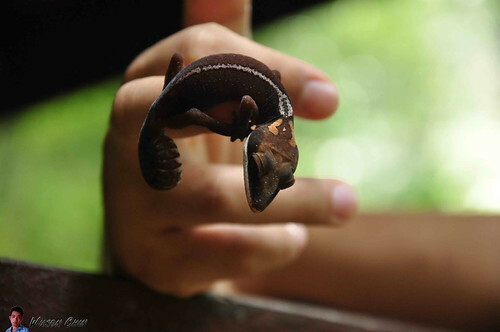 They are there because of doing research, and one of the students showed us this... the Cat Eyed Gecko. But the one I saw, it has a silver eyes. the scientific name is Aeluroscalabotes Felinus. This is the only species in the region to posses eyelids and to be capable of closing its eyes. 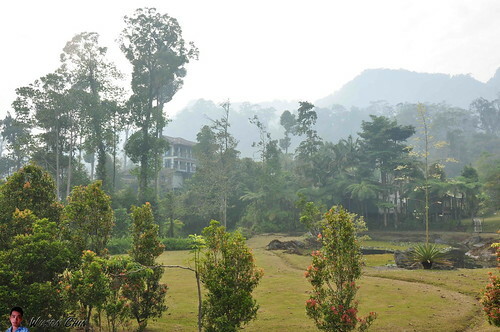 Borneo Highland Resort, Batu Panggah, Penrissen Summit Trail., a set on Flickr. yes Rook, I like that place very much. 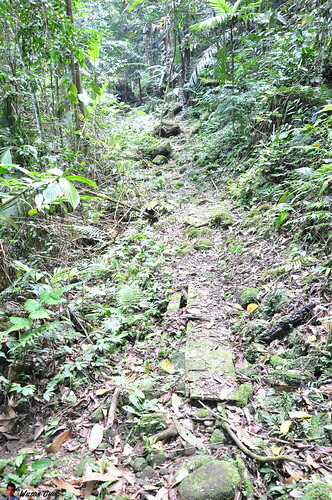 The jungle are still rich with flora and fauna. And the air are fresh too.